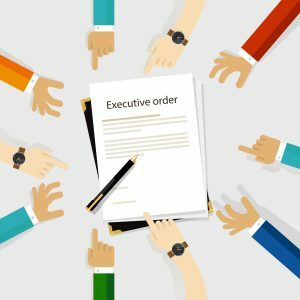 On July 10, 2018, the White House signed an Executive Order that gives agency heads greater discretion over the selection of administrative law judges. The United States federal government employs 2,000 judges, with the largest number serving in the Social Security Administration as the judiciary for benefit claims. This, in effect, overturns the Administrative Procedure Act (1946), which set up a system for choosing judges based on scores in detailed examinations. This places the future selection of administrative law judges more directly in the hands of political appointees, who may not have adequate experience or knowledge on important issues to make effective decisions. In this order, it states that the only requirement for an appointee is to “possess a professional license to practice law and be authorized to practice law”—making any lawyer qualified to serve as an administrative law judge. Before this order, requirements to serve included a vetting process through the Office of Personnel Management (OPM), as well as 7 years of experience as an attorney. The order does, however, add that “each agency shall follow the principle of veteran preference as far as administratively feasible,” which is vague and open to interpretation. For those applying for Social Security disability benefits, this decision could impact you or a loved one. If judges selected lack education about the importance of benefits for those with disabilities and the long and trying process until a decision is made by the court, many people’s cases in the courts could be at risk. Those applying for Social Security benefits deserve to have lawyers who are unbiased and well versed in the issues that affect these people’s lives. This Executive Order may negatively impact many people applying for benefits if the administrative law judges are biased against them. It will be important to watch the appointment of Administrative Law Judges to the agency over the next months to see its impact on the court’s rulings for those with disabilities. If you or a loved one has a mental or physical disability, please contact Lisa Siegel, Georgia Disability Lawyer, to discuss possible legal action. Tagged: "executive order" and "administrative law judges"